Now that the Brexit vote to leave Europe went through, the uncertainties that persist are palpable and it’s very hard to understand how Britain's new normal will be like. There's a lot of pessimism on the future but it's the action of consumers, businesses and politicians after the referendum that will determine how the future will be. Glaring issues such as trading with Europe exist, essentially Britain's top trading partner. Whether there'll be bilateral agreements with the European Union, Brexit represent not a single event or thing but the beginning of diverse changes that the nation will have to discuss with other partners. Consumers and retailers are hugely dominated by all manner of frustrations as market turbulence immediately followed the Leave vote. While the full effect of Brexit will be felt from 2018 when Britain will finally leave EU officially, the immediate disastrous effects on the stock exchange and the sterling pound are expected to dissipate at least for now. In light of this, the way the retail future will be like by 2018 paints a picture of different colours that might not be great news even with the Brexit aftermath still very fresh. Essentially, by 2018, the total number of retail stores is expected to go down by 22 percent to about 220,000 from a high of 281,930. 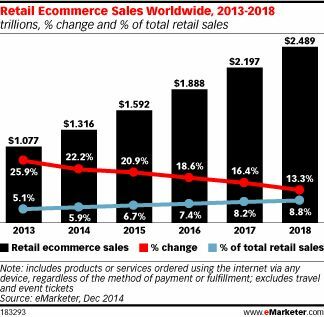 At the same time, sales on online retail are expected to hit 21.5 percent by 2018 from 12.7 percent by the turn of 2013. Medium sized and major companies, about 164 in number are expected to go into administration, which will see over 140k workers losing their jobs and 22.6k stores going down. At the same time, the High Street could be in trouble as 41 percent of town centres will see about 27,638 high street stores going down by 2018. It's worth noting that the UK online retailing world is growing and seeing a huge increase in retail sales. This has been a very critical observation and lots of British and foreign observers are still analysing how the region will turn out as retail innovation bug hits home. Noteworthy is the fact that online retailing is turning out to be made up of mostly North American and European retailing. In Europe, online retail growth rate stood at 18.4 percent in 2014, 18.6 percent by 2015. After the recession, lots of shoppers today are turning up online to purchase their products, ignoring traditional stores. The predictability and comparative ease of the internet search has made retailing online very lucrative and attractive for all manner of sectors and niches. In Europe, the online retail market is mostly dominated by France, Germany and UK, whom together actually caters for the 81.5 percent of online sales in Europe. In UK, Online sales stood at £52.25 billion. £60.04 billion is expected for 2016. Mobile ecommerce has seen a lot of growth and currently 70-80 percent of websites visits are taking place via mobile devices. Nonetheless, in Europe online spending via mobile devices was only 20 percent with 28.6 percent of shoppers in the UK using mobile devices in 2015. Overall online retail sales through mobile devices are highest in Europe, where online sales via laptops and PCs stood at 6 percent only. In terms of traditional stores vis a vis online retailing, the effect is already clear. Traditional shops are losing their market; in 2016 alone online retailers are growing by 16.7 percent while retail markets remain stagnant. Sales through traditional stores are expected to dip by 1.5 percent in 2016 in Europe and 4.3 percent in the United Kingdom alone. Obviously, it's already creating a huge strategic problem for many furniture retail stores and other industries while less physical stores mean a diminished employment rate. Consumers are also shunning the high street for other reasons with the spending in high street declining from 50 percent by the turn of the 21st century to an expected 40.2 percent by 2017. As a result of less shopping in high street stores, online retail is expected to enjoy 21.5 percent of retail sales margins by 2018 from just 12.7 percent in 2013. As lots of transactions took place on the web, those retails with very splendid and strong online offering could have enjoyed a national presence easily and fast with just about 70 retail stores on the high street in 2013, while in 2006, 250 stores in the high street were required for a company to be deemed to have a national presence. The United Kingdom has been facing a high street stores and online retail dilemma. Retailers and retailing as a whole has to make very strategic moves to allow web retailing to work hand in hand with in-store retailing chains and let high street stores to self transform. On the contrary, if decisions aren’t made the result will be lots of retailers disappearing or being obliterated as a significant category area in business will be dominated by web retailers.